Puerto Vallarta Continues to Shine! As America’s baby boomers continue to age and look forward to longer and longer life spans, they are setting their sights on retirement and making their U.S. dollars last as long as possible. And at upwards of 16 Mexico pesos to the dollar, this becomes ever more feasible. Hence the dramatic up-tick in migration south of the border adding to an ever-growing ex-pat community. A small fisherman’s village no more, Puerto Vallarta’s modern explosive growth dates back around 50 years, during the massive media hysteria and paparazzi that surrounded the scandalous extramarital affair between world famous actress Elizabeth Taylor and then married Richard Burton during the filming of John Houston’s 1964 movie ‘The Night Of The Iguana’. From that moment on, the Pacific Coast’s cobblestone clad Mexican beach town was forever in the global spotlight and on the map for tourists from the United States and Canada. Fast forward to 2015, the once sleepy town along on Banderas Bay has grown to become the fifth largest city in the state of Jalisco, with a population that has seen an increase from around 16,000 in 1960 to over 255,000 in 2010, an astounding growth of over 1,500% (Based on 2010 census report). With a thriving real estate market that continues to experience year over year growth, adding more foreign residences, those numbers will likely see a large increase with the 2020 census. And it’s no surprise; Puerto Vallarta has constantly been ranked at the pinnacle of “Top Destinations Worldwide” from a variety of sources. In 2010, AARP Magazine rated Puerto Vallarta as the “undisputed #1 destination for American retirees” on their ‘Top 5 Best Places To Retire Abroad‘ list, crediting Vallarta’s wonderful climate, 50,000 American retirees community and easy access to the States. This year, Kathleen Peddicord, author and publisher of Live And Invest Overseas, placed PV #2 on their ‘World’s Top 21 Retirement Destinations Revealed Annual Index’ list for its luxury level developments, history and charm. 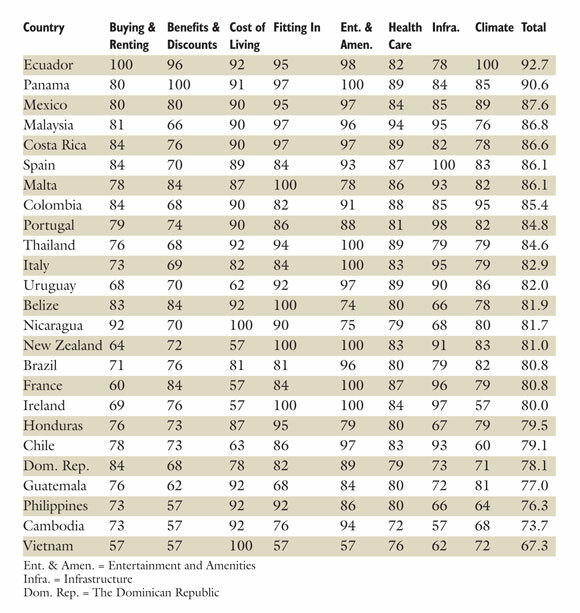 Another highly praised ‘The World’s Best Places To Retire In 2015‘ list came from International Living, placing Mexico at #3 on their list (see chart below), pointing out Puerto Vallarta’s pristine beaches, established expat communities, lower health care costs, to name a few. 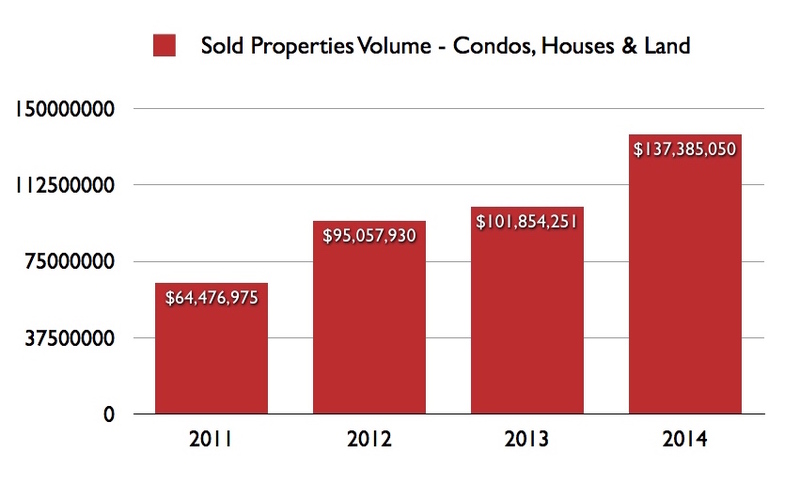 In looking at the above sales graph, one can see Puerto Vallarta’s real estate momentum has been in an upswing for 4+ years, with 2015 sales data indicating another stellar year for the once sleepy Mexican tropical village. Even though negative and often times sensationalized and hyper exaggerated media “reporting” north of the border has sidelined some never-traveled-to-Mexico-tourists, the country continues to produce record breaking international tourism arrivals. According to the 2015 UNWTO (United Nations World Tourism Organization) Tourism Highlights, international tourism arrivals increased by 4.3% in 2014, reaching a record total of over 1.133 billion, up from 1.087 billion in 2013 and around 1 billion mark in 2012. 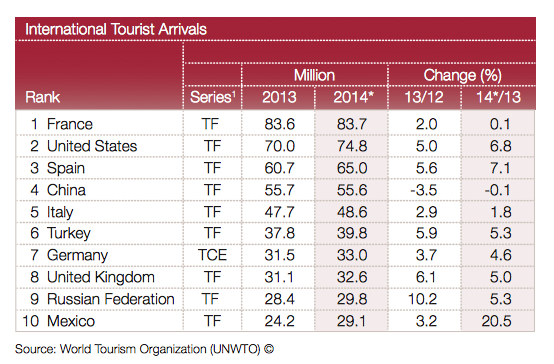 The Americas recorded the strongest growth, with an impressive 8% increase in international arrivals. UNWTO goes on to report; ‘International Arrivals Soar In Mexico…In the ranking by arrivals, Mexico climbed five places, re-entering the Top 10…’ with over 29 million international visitors and +20% increase in 2014! It seems some tourists have decided to do some fact checking before believing everything they read or watch on television. In reality, virtually every city across the globe has some sort of crime, but to broadcast a blanket statement that an entire country is “up in flames” and issue travel warnings blazing across the internet, may be premature at best and uncalled for. With such strong growth in international tourism, a robust real estate market, and high praise by reputable associations across the world, it’s no wonder Puerto Vallarta continues to inch closer and closer to an ideal lifestyle and affordable luxury people often dream of.